Pandora’s Lunchbox: Pulling Back the Curtain on How Processed Food Took Over the American Meal | Democracy Now! longtime journalist covering the food industry. Her new book is Pandora’s Lunchbox: How Processed Food Took Over the American Meal. AMY GOODMAN: As we continue deep inside the $1-trillion-a-year “processed-food-industrial complex,” we turn to look at how decades of food science have resulted in the cheapest, most abundant, most addictive and most nutritionally inferior food in the world. And the vitamins and protein added back to this processed food? Well, you might be surprised to know where they come from. That’s the focus of a new book by longtime food reporter Melanie Warner, author of Pandora’s Lunchbox: How Processed Food Took Over the American Meal. MELANIE WARNER: Yeah. Well, hi, Amy. It’s great to be here. You know, one of the things with processed food that I found while doing this book, is not only that it has an abundance of the things that Michael was talking about—salt, sugar, fat—it’s also what it’s lacking, which, it turns out, is naturally occurring nutrition, in many cases. So that’s vitamins and minerals and fiber and things like antioxidants. AMY GOODMAN: We’re going to talk soy products in part two. 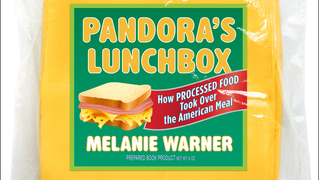 Melanie Warner, longtime journalist covering the food industry, her new is called Pandora’s Lunchbox: How Processed Food Took Over the American Meal. Juan González will be in Phoenix tonight, in Albuquerque, as well in Santa Fe. Check our website at democracynow.org.